St. Joseph’s Youth Group is part of St. Joseph’s Catholic Church in Denver, Colorado. 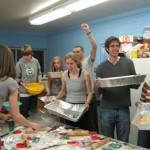 The Youth Group consists of young people in grades 7-12. Our goal is fellowship that builds community within the Church. We are a very positive and dynamic group that engages in a variety of activities including prayer and scripture study, as well as social and fun times. We meet each Wednesday during the school year and have varying activities in the Parish Center in June and July. Your generous donation will help us to continue our efforts to strengthen the faith of our youth.